For a chemical reaction to take place, it requires a certain minimum amount of energy, called its activation energy. If a substance can lower this activation energy without itself being changed or consumed during the reaction, it is called a catalyst or catalytic agent. The action of a catalyst is called catalysis. 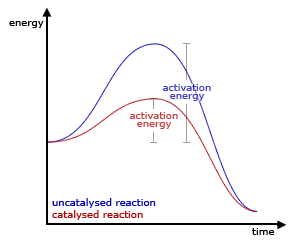 The catalyst reduces the activation energy by providing an alternative pathway for the reaction to occur. In so doing, the catalytic agent makes the reaction proceed faster and at a lower temperature than the uncatalyzed reaction. In addition, if a given reaction can produce a variety of products, the catalyst may help direct the reaction toward generating a specific subgroup of products. Catalysts play essential roles in biological systems and industrial processes. In living organisms, enzymes catalyze numerous biochemical reactions that sustain life and are involved in growth and reproductive functions. In industry, catalysts are used for a wide array of manufacturing processes, including the production of ammonia, sulfuric acid, polymers, and petroleum product substitutes. In industrialized countries, perhaps the most familiar example of the use of catalysts lies in the catalytic converter, a device that breaks down harmful substances in automobile exhaust. Research into catalysis and the use of catalysts continues to be a focus of many investigators in the pure and applied sciences. In a more general sense, the term catalyst may be applied to any agent (including a person or group) that brings about accelerated change. For example, someone may be called a "catalyst for political change." The term catalysis was coined in 1835 by Jöns Jakob Berzelius, who noted that certain chemicals speed up a reaction. The word is derived from the Greek noun κατάλυσις, related to the verb καταλύειν, meaning "to dissolve," "annul," "untie," or "pick up." Around the same time, the chemist Alexander Mitscherlich referred to "contact processes," and Johann Wolfgang Döbereiner spoke of "contact action." Döbereiner worked on the use of platinum as a catalyst and invented a lighter that was ignited by the action of hydrogen on a platinum sponge. This lighter, called Döbereiner's lamp, became a huge commercial success in the 1820s. A catalyst participates in one or more stages of a reaction, but it is usually not a reactant or product of the overall reaction that it catalyzes. An exception to this rule is the process known as autocatalysis, in which the reaction product acts as a catalyst for the reaction. A substance that inhibits the action of a catalyst is called an inhibitor; one that accelerates the action of a catalyst is called a promoter. A catalyst may react with one or more reactants to form a chemical intermediate, and this intermediate subsequently reacts to form the final reaction product. In the overall process, the catalyst is regenerated. Alternatively, the catalyst may provide a surface to which the reactants bind, facilitating their reaction by bringing them close together. The products that are formed are released from the catalyst. Consider the following reaction scheme, in which C represents the catalyst, A and B are reactants, and D is the product of the reaction of A and B.
Catalysts can be either heterogeneous or homogeneous. Biological catalysts (or biocatalysts) are often considered a separate group. A heterogeneous catalyst is one that is in a different phase from that of the reactants. For example, a solid catalyst may be used in a liquid reaction mixture. On the other hand, a homogeneous catalyst is one that is in the same phase as that of the reactants. For example, the catalyst may be dissolved in a liquid reaction mixture. A simple model for heterogeneous catalysis involves the catalyst providing a surface on which the reactants (or substrates) temporarily become adsorbed. Chemical bonds in the substrate become sufficiently weakened for new bonds to be created. As the products are generated, they bind relatively weakly to the catalyst and are therefore released. Different possible mechanisms for reactions on surfaces are known, depending on how the adsorption takes place. For example, consider the Haber process to manufacture ammonia from nitrogen and hydrogen. In this case, finely divided iron acts as a heterogeneous catalyst. As the reactant molecules (hydrogen and nitrogen) bind to the catalyst, this binding process has two effects: first, the molecules come closer together than they would be in the gas phase; and second, their internal bonds are weakened. In this manner, the catalyst makes it possible for the reactant molecules to react faster than they would if they had remained in the gas phase. In homogeneous catalysis, the catalyst itself may be transformed at an early stage of the reaction, and it is regenerated by the end of the reaction. An example is the breakdown of ozone by chlorine free radicals (free atoms of chlorine). Chlorine free radicals are formed by the action of ultraviolet radiation on chlorofluorocarbons (CFCs). These free radicals react with ozone to form oxygen molecules, and chlorine free radicals are regenerated. Some of the simplest reactions are as follows. In nature, enzymes are catalysts for biochemical reactions that take place within living organisms. Most enzymes are proteins, but some enzymes—called ribozymes—are made of RNA. Some DNA molecules, called deoxyribozymes, have been found to have catalytic activity. In addition, some antibodies, usually prepared artificially, have catalytic activity and are called abzymes. This generic graph shows the effect of a catalyst in a hypothetical chemical reaction. The energy level of the initial reactants is on the extreme left of the graph; that of the final products is on the extreme right. Notice that the catalyzed pathway (red) has a lower activation energy, but it produces the same final result as the uncatalyzed pathway (blue). Catalysts work by providing an alternative mechanism for a chemical reaction—a mechanism that lowers the activation energy relative to that of the uncatalyzed reaction. This means that catalysts reduce the amount of energy needed to start a chemical reaction. Also, the "transition state" (unstable transitional intermediate) formed by the reactants during a catalyzed reaction is usually different from that formed during an uncatalyzed reaction. The energy profile diagram on the right shows that the catalyzed pathway (red) has a lower activation energy than the uncatalyzed pathway (blue). In addition, it shows that the net change of energy for the overall reaction is the same, whether a catalyst is used or not. Thus, catalysts can enable reactions to take place at much faster rates, or in certain specific ways, or at lower temperatures. In addition, some reactions run only in the presence of a catalyst. Catalysts cannot make energetically unfavorable reactions possible. They have no effect on the chemical equilibrium of a reaction, because the rates of the forward and the reverse reactions are equally affected by the catalyst. The SI derived unit for measuring the "catalytic activity" of a catalyst is the katal (which is moles per second). In biochemistry, the catalytic activity of an enzyme is measured in terms of enzyme units. The activity of a catalyst can also be described by the turnover number (TON). In enzymology, turnover number is defined as the maximum number of moles of substrate that an enzyme can convert to product per catalytic site (of the enzyme) per unit time. In more chemical fields, turnover number (TON) is defined as the number of moles of substrate that a mole of catalyst can convert before the catalyst becomes inactivated. The term turnover frequency (TOF) is used to refer to the turnover per unit time, as in enzymology. A catalyst can be poisoned if another compound (similar to an inhibitor) alters it chemically or bonds to it and does not release it. Such interactions effectively destroy the usefulness of the catalyst, as it can no longer participate in the reaction that it was supposed to catalyze. Common catalyst poisons are lead, sulfur, zinc, manganese, and phosphorus. According to some estimates, 60 percent of all commercially produced chemical products require catalysts at some stage during their manufacture. The most effective catalysts are usually transition metals or transition metal complexes. The catalytic converter of an automobile is a well-known example of the use of catalysts. In this device, platinum, palladium, or rhodium may be used as catalysts, as they help break down some of the more harmful byproducts of automobile exhaust. A "three-way" catalytic converter performs three tasks: (a) reduction of nitrogen oxides to nitrogen and oxygen; (b) oxidation of carbon monoxide to carbon dioxide; and (c) oxidation of unburnt hydrocarbons to carbon dioxide and water. Other examples of catalysts and their applications are as follows. Ordinary iron is used as a catalyst in the Haber process to synthesize ammonia from nitrogen and hydrogen, as mentioned above. The mass production of a polymer such as polyethylene or polypropylene is catalyzed by an agent known as the Ziegler-Natta catalyst, which is based on titanium chloride and alkyl aluminum compounds. Vanadium(V) oxide is a catalyst for the manufacture of sulfuric acid at high concentrations, by a method known as the contact process. Nickel is used in the manufacture of margarine. Alumina and silica are catalysts in the breakdown of large hydrocarbon molecules into simpler ones—a process known as cracking. A number of enzymes are used for chemical transformations of organic compounds. These enzymes are called biocatalysts and their action is called biocatalysis. The electrodes of a fuel cell are coated with a catalyst such as platinum, palladium, or nanoscale iron powder. The Fischer-Tropsch process is a chemical reaction in which carbon monoxide and hydrogen are converted into liquid hydrocarbons, in the presence of catalysts based on iron and cobalt. This process is mainly used to produce a synthetic petroleum substitute for fuel or lubrication oil. Hydrogenation reactions, which involve the addition of hydrogen to organic compounds such as alkenes or aldehydes, require a catalyst such as platinum, palladium, rhodium, or ruthenium. A number of chemical reactions are catalyzed by acids or bases. ↑ Note that the term "adsorption" means binding to the surface of a substance. In this case, the reactants bind to the surface of the catalyst. ↑ "Recognizing the Best in Innovation: Breakthrough Catalyst," R&D Magazine, September 2005, pg 20. This page was last modified on 17 January 2017, at 17:27.